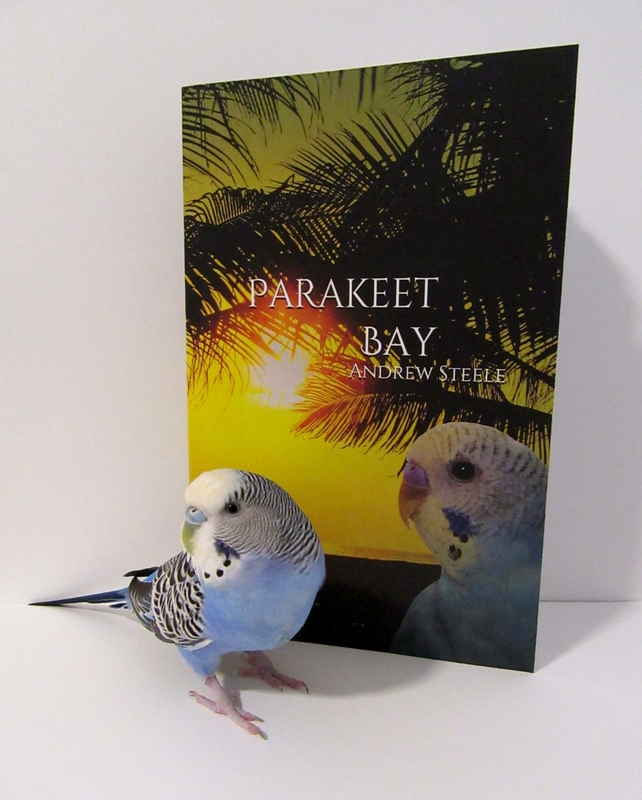 Posted on March 29, 2019 by Michelle M.
This month’s book is Parakeet Bay by Andrew Steele. Budgie Louie is ready for a vacation. He convinces his brother, Lightning, that Parakeet Bay would be the perfect place for a holiday. At first, Parakeet Bay seems like a birdie paradise, but when Louie meets Kate, a beautiful budgie employee, he discovers the resort harbors some dark secrets. Louie and Lightning do some investigating and soon find themselves in danger. Will the two budgies be able to escape Parakeet Bay and return home? Cooper loved this book. She liked the humor (Louie packs his bell), adventure (a daring escape) and romance (Kate and Louie). There are no illustrations, but at the end of the book there is a little blurb and photo of the author’s budgies (who inspired the story). They are described as being blue, Louie with a bright yellow face, and Lightning, a pearly white face (just like Ozzie and Harvey!). This entry was posted in Book Report and tagged Andrew Steele, budgie, Cooper, Cooper's book report, parakeet, Parakeet Bay by Michelle M.. Bookmark the permalink. Sounds like a cute book.